As cleaning agents, fluxes facilitate soldering, brazing, and welding by removing oxidation from the metals. Common fluxes are: silver brazing fluxes, silver brazing flux for carbide tipped tools, copper brass brazing flux, ammonium chloride or rosin for soldering tin; hydrochloric acid and zinc chloride for soldering galvanized iron (and other zinc surfaces); and borax for brazing or braze-welding ferrous metals. 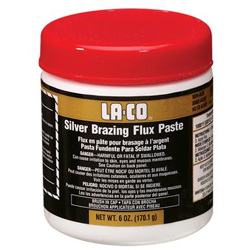 Silver Brazing Flux is a low temperature item used with all standard Silver Alloys with or without Cadmium. It is active and protective at about 600° C. Application of this Flux in paste or powder form for dissimilar or similar metals give stronger and clean joints hence this is accepted General Purpose Flux for use with all low temperature Silver Brazing Alloys. It will successfully flux all the common engineering materials and its residues are soluble in hot water. It is a high temperature Silver Brazing Flux well suited for Silver Brazing Alloys containing Nickle. It is recommended to use in paste form, where pre-fluxing on the job is done. This Flux has excellent fluidity and cleaning activity at about 650° C. Its stronger cleaning properties at higher working temperature makes it most suitable for tools brazing. This Flux has good fluidity, cleaning activity and low moisture contents. Application of this Flux in paste or powder form for copper base alloys to be brazed to M. S. or similar alloys give stronger and cleaner joints. Active temperature of this Flux is ranging from 780-1050°C.